dun get shock.. cuz we finally sedar..
we quite serious at first..
we end up doing tis..
jessy in specs.. nice isn't she??? jessy n ongy with specs.. ^^ pretty neh? always the sweet smile from her..
pretty, talented, sweet gal... wan her number?? 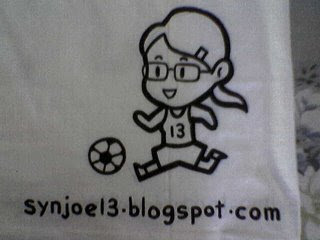 but cuz of exam.. i got no time to blog bout it..
we did j3 shirt jux for fun n for the remembrance of our frenship..
will keep going without an ending..
ok la.. hereby i upload sum j3 shirt pic for u to c..
the back design of syn joe..
feel like doing one with ur fren or bf/gf?? find urself... if u really do wish to do..
with that i upload some photos of my new hair style..